Alvaro Morata never really arrived at Chelsea. Not really. Even now, when he's still a member of the squad, albeit an inactive and estranged one seeking a move, he's not really here. Because he never​ actually arrived. No, the real Alvaro Morata is stuck in limbo somewhere between the Madrid-Barajas Adolfo Suarez and Turin-Caselle airports. Sure, there were claimed sightings of him scoring a hat-trick on April 5th 2017 at Leganes, or on September 23rd of the same year in Stoke-on-Trent, even reports of a crucial equaliser in Madrid itself four days later. But these were all subsequently disproved. No, many believe the last true citing of Morata to be in France in the summer of 2016, where he attended the UEFA European Championship with Spain. In that tournament, the striker was chosen ahead of Blues marksman Diego Costa, and showed why. He seemingly possessed enough of the signature tenacity and strength of Costa, with a bit more nouse. A bit more skill. A bit more...sophistication. He was domineering in the air, technical on the ball, and hungry for goals. 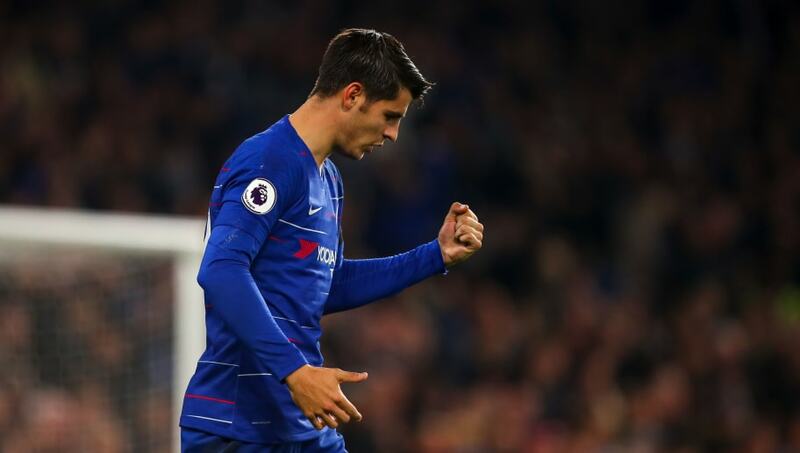 Though La Roja's campaign was ended prematurely by Antonio Conte's Italy side in the last 16, it was still enough to convince the soon-to-be ​Chelsea manager that Morata was the ideal candidate to replace his want-away compatriot at Stamford Bridge a year later. Well, actually the part where Conte wanted him is cloudy at best, but even if we assume this was the case, the Italian still didn't get what he bargained for. For all intents and purposes, the ditching of Costa for Morata at a net spend of around £3m was a no-brainer. It was great business. Why would you not bring in a 24-year-old who has already usurped your unsettled and ageing forward in the national pecking line, and at such an insignificant outlay? There's literally nothing wrong with it. No downside. It makes too much sense. All the boxes were ticked. Could he cut it on a wet and windy Wednesday night in Stoke? Well he was definitely fine when he took on those conditions on a Tuesday night in Manchester in September 2015, so why the hell not? In so many ways, that ​Champions League group stage performance against Manchester City at the Etihad represented everything Chelsea fans thought they were getting when the club signed Morata. Now, looking back on it, there are more than a couple moments that portend to they imposter they actually got; the petulance, the unnecessary flops (I would say dive, but 'flop' just describes it so much better), the mis-control etc. BUT. Crucially, it mainly showed a never-say-die attitude, a youthful exuberance, a frightening pace and an expert finishing ability. The winning goal remains one of my favourites from the last decade. For whatever reason, from the first moment I watched it, it resonated with me in a surprisingly deep way. Whether it was the lashing rain, the perfectly groomed nature of the Spaniard's head/beard, the beguiling technique or the knee slide to finish, it was simply magnificent. Upon further rewatching, I think it's actually the slo-mo pan from behind just as he strikes it. Where he sidesteps in tandem with the camera as he watches it curl past an outstretched Joe Hart in goal. It's aesthetic heaven. But we were never given such glorious highs in west London. We were occasionally given the pace, and we were given a lot of the aerial prowess, but never the hunger, and very, very rarely the composure and technique. The club have had a strange relationship with strikers ever since the days of Eidur Gudjohnsen and Jimmy Floyd Hasselbaink. Sure, they've admittedly had their greatest ever frontman, in Didier Drogba, during this period, but think about Hernan Crespo, Andriy Shevchenko, Fernando Torres, Demba Ba, Loic Remy, Romelu Lukaku, Michy Batshuayi, Bertrand Traore, Samuel Eto'o, Alexandre Pato, Radamel Falcao etc etc. What a surreal group of names that is. What a strange contrast of big money flops and low-expense fillers. And Morata fits right in there alongside Torres, Crespo, Shevchenko and Lukaku. Highly rated additions who could never fulfil their expectations. And yet, somehow, the following stat is completely true: ​Alvaro Morata has one more goal than Didier Drogba had at this moment in his Chelsea career. Let that sink in. Now, Drogba's redemptive career arc has been well documented, and there were perpetual rumours of him leaving London throughout his tenure. Such a comparison might usually provoke calls for patience, but why doesn't that seem applicable here? Well, for one thing, the club had a depth up front that is unimaginable now, but more presciently, Drogba displayed desire all through his dips, and had his biggest moments on the big occasion (shock). He scored five goals in nine Champions League games in his first season, including two goals and an assist in the astoundingly high quality quarter final tie with Bayern Munich. Morata has shown almost none of that in his tenure. How could he? Just like Joaquin Phoenix in Lynne Ramsay's latest film, he was never really here.